With the summer season drawing towards autumn, Itchenor Sailing Club are again looking at new initiatives to maintain the overall package of first class sailboat racing in the delightful Chichester Harbour, writes the club’s rear-commodore sailing Mike Wigmore. For 2019 one new part of this will be the introduction of the Merlin Rocket to the portfolio of classes that are encouraged to race at the club. The Merlin Rocket class was formed by the amalgamation of two very similar types of dinghy in the 1950s and you won’t have difficulty guessing what they were called. Since then they have been more commonly known as the Merlins. The class is the premier adult two-person hiking dinghy in the UK and a national class, rich with history. It is strongly represented around the country. It provides not only competitive racing but also a fun and friendly atmosphere among the sailors. The plan is to develop the fleet around focus weekends in the summer and winter to attract not only existing and new members but also visitors. 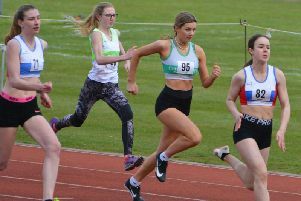 At this time of year most of the existing racing classes continue with their programmes of regular club racing with some one-day events interspersed to add to the fun. Conditions are not always as perfect as we might like. On day two of the recent Bob Massey trophy for the Swallow Class the forecast was stormy. Even the Velo South ccling festival had to be cancelled. However a small but keen group of sailors convened initially in the pouring rain to contest the two deciding races. By mid-morning the sun was out and, as is often the case, the weather was not as dreadful as forecast. Two races were completed with only a brief spell of very brisk wind creating a challenge.